Cook pasta al dente according to package instructions and drain, reserving about 1/4 cup of pasta water. Return pasta to pot and cover to keep warm. In a medium bowl, whisk together Pasta Sauce and eggs, and set aside. Meanwhile, in a large skillet over medium heat, brown pancetta for 3 to 4 minutes, or until crisp, turning occasionally. 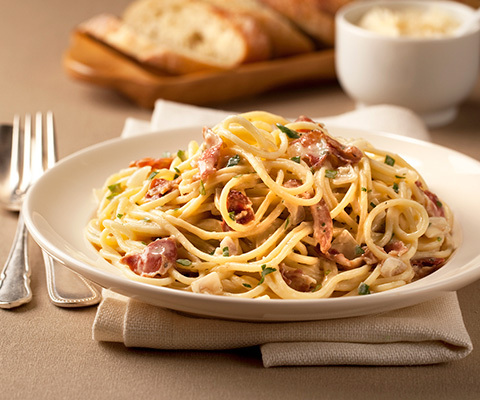 Place pancetta on paper towels and coarsely crumble or chop, reserving drippings. In the same skillet with reserved drippings over medium high heat, cook shallots and garlic for 2 to 3 minutes, stirring occasionally. Stir in wine and cook for another minute. Remove skillet from heat. Return pasta pot to stovetop over low heat. Add shallot mixture to warm pasta and lightly toss with tongs. Slowly add Pasta Sauce mixture, a little at a time, tossing pasta frequently to prevent eggs from scrambling. Cook for 4 to 6 minutes, or until sauce is cooked through and thickened. Add reserved hot pasta water if needed to thin sauce to desired consistency. Add cheese, parsley and pancetta crumbles, and cook for another minute, stirring frequently. Season with salt and pepper to taste if desired. Serve immediately. Literally just add bacon and more parmesan and you have mega taste. Skip any extra salt if you have preseasoned chicken. Absolutely awesome if you use montreal chicken spice and garlic powder instead of pepper but still use the salt. Taking the leftovers for lunch tomorrow. Again, delicious. Delicious, and yes i would totally recommend this tasty dish.